NEW YORK (CNNMoney) -- The rich are different from you and me: They're buying real estate. After four straight years of declines, sales of million-dollar homes and condos rose last year in all 20 major metro areas, according to DataQuick Information Systems. On average, these cities saw an 18.6% jump in high-end home sales. San Jose, Calif., had the biggest market for million-dollar homes, with a 27.4% spike in sales last year; Phoenix saw the smallest increase at just 0.4%. Meanwhile, sales outside of this price point actually fell 2.8%. "It hasn't been a good six months for all people, but it was a good six months for rich people," said Glenn Kelman, CEO of Seattle-based real estate brokerage Redfin. "When Wall Street goes up, rich people buy homes." And Wall Street has gone up: Stock values have nearly doubled from their March 2009 lows. "Higher income households are feeling better about their financial security," said Greg McBride, chief economist for Bankrate.com. As their confidence soared, the wealthy took advantage of bargains in expensive homes. An average seaside manor on Jupiter Island, Fla., that might have sold for $4 million in 2006 cost less than $3 million last year. The Brentwood bungalow in L.A. was $1.5 million instead of $2 million, and that Scarsdale colonial fell to $1.1 million after gong for $1.5 million four years ago. Getting a mortgage for these expensive homes was cheaper as well. Normally buyers have to take out a jumbo loan to finance any mortgage beyond the $417,000 threshold ($729,000 in high-cost cities such as New York). These loans have higher interest rates because they are considered non-conforming -- or higher risk -- and are not backed Fannie Mae or Freddie Mac. In 2009 buyers of high-end homes paid 1.8 percentage points more in interest than the average buyer. But in 2010, that spread had shrunk to just 0.6 points more. That reduction would save about $780 a month on a million-dollar mortgage. That may not matter much when you're a software gazillionaire, but for buyers stretching to reach that league, it can make a difference. Some metro area markets experienced modest price rebounds in 2009, which was enough to push a handful of homes above the million-dollar threshold. In San Jose, for example, home values rose for several quarters, boosting the prices of homes right on the border of a million. 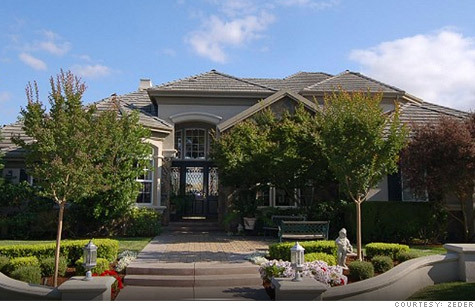 "You had some creep into the million-dollar bracket," said broker Scott Kliewer with Windermere Silicon Valley. But in most cities, the million-dollar homes sold were actually million-dollar homes, not just those that crossed into the high-end territory because of rising prices. In New York, where volume grew nearly 25%, high-priced home sales were driven by bonuses on Wall Street. Even though bonuses were slightly smaller last year, they still topped $120,000. And that's just the average; many employees brought home significantly more. Wealthy clients have driven the business for Gary Reavis, the CEO of Keller Williams Hollywood Hills in Los Angeles, where sales rose about 20%. He attributes the jump to the stock rebound and good times in some of the area's best-paying industries, including entertainment. And in Washington, government workers continued to bolster the high-end market, which grew 20% here as well. The DC area is now the best educated place in the nation and and one of the highest paid. Median family income is now over $101,000 in the D.C. area and more than $109,000 in the Bethesda-Rockville, Md., area. Other big gainers were Honolulu (26%), San Diego (14%) and Nashville (13%). The real estate industry may take some solace from the mini boom in high-end sales, but it does not necessarily mean good times are ahead for the rest of the market. In fact, the rest of the market is facing a potential 25% drop in prices and stalling sales. "There are not a lot of million-dollar home buyers even in the best of times," said Bishop. "It's always nice to see any segment come back, but it's the middle of the market we would like to see set the pace."